With its majestic views, serene mountains, and picturesque meadows; Kashmir has been living up to the hype of being called as a heaven on earth. Be it the silver radiating clouds, the snow-clad mountain ranges, visually acute landscapes, amusing trails, valleys full of flowers or the alpine peaks, Kashmir has everything to charm you. In the concrete jungle we are living, every sight of Kashmir is worth a million dollars to pay for. Bruised and yet ornamented by history, culture, and politics; people here have an absolute sense of humor and treat the tourists with generosity. If you want a perfect holiday with your family, Kashmir is the best place to head. To make sure that your trip turns out to be the best one, here's a list of must visit places in Kashmir that should be included in the Kashmir holiday packages, when on a family Trip. 1 Srinagar: One of the most prepossessing places in India, this capital of Jammu & Kashmir will make you fall in love with its beauty. Once in Srinagar, you can indulge in various activities like taking a stroll in the famous Shalimar Gardens or a visit to the Dal Lake. You must also not miss the mesmerizing top view from the Shankaracharya Temple. You might as well want to stay in the well-known houseboats on your trip with your family. The best time to visit Srinagar is from February to July. Try not to visit the place in winter as the temperature is extremely low which can put a full stop on the fun. 2. Leh and Ladakh: If you have a family who loves adventure, do visit Leh and Ladakh. Though this destination is highly famous for the romantics, the bikers, the adventurers and the college goers; visiting it with your family can be quite an interesting experience. The sapphire blue skies, the heavenly hills and the turquoise blue waters of the Pangong Tso Lake together can mesmerize your senses and take you to a peaceful journey. 3. Gulmarg: Widely known as the snow paradise for the skiers, Gulmarg is a pristine holiday destination in Jammu and Kashmir. 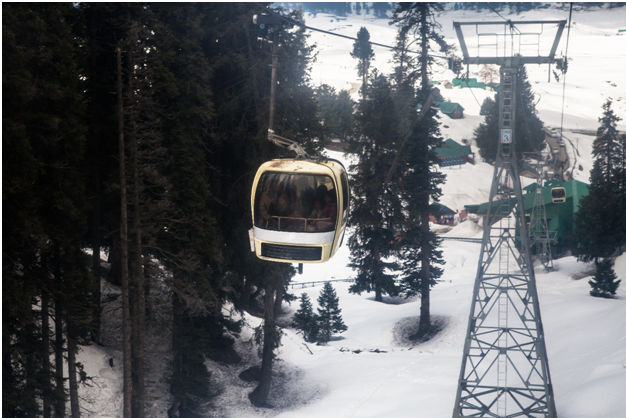 The place is also famous for the Gondola lift which is one of the world's highest ropeways. It has a 5km aerial distance and the top view at a sea level of 3979 meters can leave your dumbstruck with its grandeur. Other places you can visit in Gulmarg with your family are Alphathar Lake, Nagin valley, and Baba Reshi Shrine. 4. Kashmir Valley: If you are Bollywood fanatic, you might spend weeks counting the number of songs that are shot in this valley. A saucer-shaped elliptical valley, it is surrounded by Pir Panjal ranges and the Karakoram ranges. The Kashmir valley is a perfect spot to trek with its amazing views and peaceful environment. If you are visiting this stunning place with your family, it is recommended to go for activities like paragliding to get the majestic view of the entire valley. 5. Sonamarg: Translated as the 'Meadow of Gold', it is a picturesque place full of undulate grasslands filled with beautiful flowers. Most of the people who visited Kashmir, refer to this place as 'Jannat'. Sonamarg also acts as a base point for zorbing, river rafting and as well as the Amarnath Yatra. If you are planning to visit this place with your family, prefer summer season and avoid winter as the place remains closed because of the possibilities of avalanches and landslides. 6. Kupwara: If you ask a child to draw the picture of Kupwara, he/she would fill the sheet with deep blues, deep greens, and deep browns. Nothing less than an impressionist painting, Kupwara is called as the 'Crown of Kashmir' and has everything that justifies the title. Its mesmerizing meadows, gushing clear water and alpine mountains can make your family trip the best one ever. 7. Kargil: As soon as you hear the name, you start imagining the war images of the year 1999. However, over the years, Kargil has turned into a tourist destination that holds a significant history. Today, a huge number of tourists visit the place because of it being the gateway to Leh and also because of the War Memorial, the Ranbhoomi and the monasteries around. Visit this place with your family and tell your children the brave tales of Indian Army. 8. Hemis: Though an unexplored region, Hemis is quite known for its national park where one can spot snow leopards in the dense forests. Not only this, you also get to witness rare species like the Bharals as well. Situated at the distance of 40km from Leh, it is prominent for the Hemis festival during which monks wear colorful masks and celebrate the festival with dance. The festival is celebrated in early June, so if you wish to witness the mystic event, plan your trip accordingly. 9. Pulwama: Somewhere in our brain, we associate Kashmir with saffron and the reason behind that are the Pulwama fields as saffron cultivation is one of the main agricultural products of the valley. The terrains have a rich culture, amiable landscapes and pleasant weather that you won’t want to come back from the fields. Pulwama is also called as the 'Dudha-Kul' or 'Anand' of Kashmir because of the highest milk production and the happiness it offers. 10. Pahalgam: Surrounded by Betaab Valley and the Lidder Lake, Pahalgam is another stunning valley that must be on your list. Some of the places that you can visit here are Baisaran Hills, Mamaleshwar Temple Pahalgam Golf Course and Kolahoi Glacier. Apart from that, you can also go for fun activities like river rafting and golfing. If you are planning to shop during your trip, you can buy things like Kashmiri shawls and Kashmiri woolen poncho called pheran. Now that you have read the list, all you need to do is discuss it with your family right away. To make your trip more memorable and hassle-free, select any of our Kashmir holidays packages for the family get ready for an ultimate trip!